This design with baseballs in the background and a baseball jersey for name & number personalization will perfect for the baseball fanatic. The colors can all be changed - so you can change the colors to match your team color - the background color, the color of the jersey sleeves, the body and even the stripes' color can be changed! 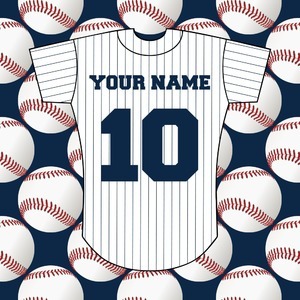 The personalization we have chosen is name and number on the back of the baseball jersey. We have also used the front of the jersey for the team name in the coordinating design. You have the choice of using the back as we have, or the front of the jersey or use both and add the team name to the personalization.